The 2011 Master Plan bases its recommendations upon a stakeholder-created University Vision. This vision statement was created through a collaborative discussion process, and is supported by a set of goals and guiding principles identifying performance benchmarks that must be met and the physical measures necessary to realize this vision. 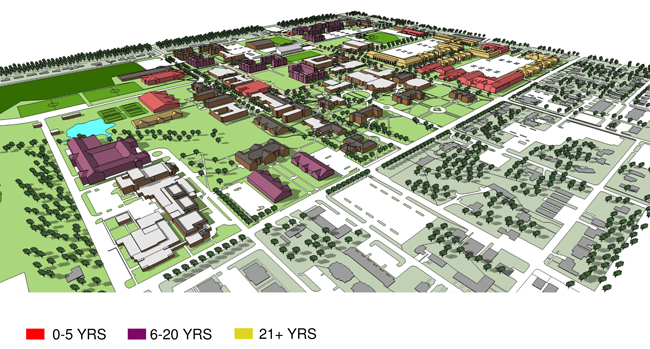 The University of Central Arkansas Campus of the Future will be a public destination that integrates a 21st century learning environment with the urban vitality of Conway and the greater region. UCA students, faculty, staff, alumni, visitors, neighbors, and potential development partners will experience a vibrant, twenty-four/seven campus. The UCA Campus of the Future will feature exemplary live/learn/work/play opportunities and environments that engage the learner, satisfy the curious, inspire the creative and attract the larger Conway community.